Monday, a dry-erase board was set up in Malcolm X Plaza, and on it was the question: What would make San Francisco State a better place? President Leslie E. Wong and his Strategic Planning Committee encouraged students and faculty to write their suggestions, which varied from “lower tuition” to “free parking,” on the board for SF State’s Strategic Planning Kickoff. “We’re looking for solid, good and challenging ideas,” said Wong, who walked around the plaza and asked students to make their way to a board to add a suggestion. 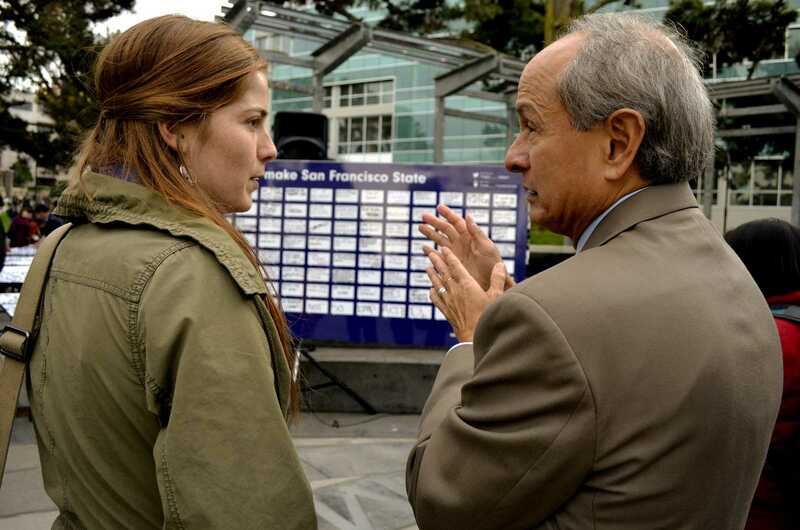 SF State’s “strategic plan” is the goal, mission, and objective for improvement for the University in the coming years. President Wong has worked on a new strategic plan with his committee of 15 faculty, students, administrators and counselors since last year and has since developed seven themes in which they plan to execute their objectives. Themes such as building SF State’s identity, maximizing student success and elevating institutional support were represented at the event with a table for each, where students were given poster boards and markers to write how they thought each goal could be achieved. The University created a Twitter campaign to solicit responses from students, faculty and staff. By tweeting “I want __” using the hashtag #SFState and, or, text the message to 415-727-7378 the SF State community could voice their suggestions to the Strategic Planning Committee. The University also created an account with Neighborhood.com, which allows residents of a community to organize and share ideas on what they want improved in their community. More than 300 SF State community members have submitted suggestions to the campus’ online forum at neighborland.com/sfstate. Monday saw the first of a series of public events to create dialogue between the Strategic Planning Committee and the SF State community. This was the first opportunity for public opinion. Senior Donna Olivera added her suggestion to the display board, which was to make campus housing more affordable. Wong said that all of the input from Monday’s event would be discussed at the next strategic planning event this Friday, and hopes a complete strategic plan will be finalized by Summer 2014. “It’s a different funding situation now, a different world with new demands on us, and a different leadership,” Wong said. The Strategic Planning Committee will organize a town hall style meeting to continue the open forum after the Thanksgiving break, according to member of the Strategic Planning Committee, Nicole Henderson.